Thanks to the Tour de France any cycling fan knows the Mont Ventoux and Alpe d'Huez. 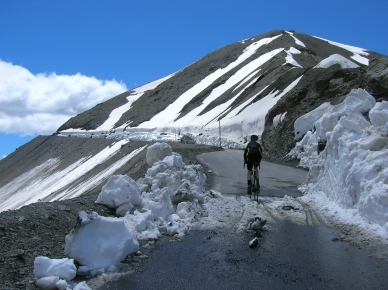 This website provides information on these two climbs, as well as on 58 further ascents in the French Alps. Assets of this part of the Alps are the numerous climbing opportunities and the relatively favorable climate. In the ranking of this page, the number one position is taken by the combination of the Col du Télégraphe and the Col du Galibier, followed by the Ventoux, despite its location at the edge of the Alps. For many it may come as a surprise that the ascent to Alpe d'Huez ("south" is the classic one) only takes rank 14. It will certainly not hold its top-15 position when in future more climbs are added.